Click here to visit the Seattle’s Best Coffee Facebook and like them. Then on the “Working Back Friday?” tab, allow their application. 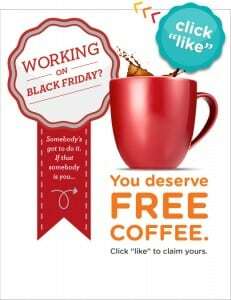 Where they ask “Working the day after Thanksgiving?” click “Yes I Am” and on the next page you’ll be able to fill out the form to request your free sample and print out a $2 coupon. thanks soo very much and a wonderful Thanksgiving to you all! !